China’s Long March 3B rocket lifted off from the Xichang Satellite Launch Center at 16:10 UTC on Sunday, thundering into the midnight hour with the Zhongxing-9A communications satellite headed to a highly elliptical transfer orbit. Blasting off from the inland launch base in the Sichuan Province just after midnight, the 56-meter tall Long March 3B/E was to turn to the south-east to overfly the Chinese main land, drop its boosters and first stage in close succession ahead of a three-minute burn of the second stage and a pair of firings of the cryogenic third stage, the second of which was to dispatch the five-metric-ton satellite into a Geostationary Transfer Orbit half an hour after liftoff. As of four hours after the day’s launch time, no official information on the outcome of the launch was provided by Chinese officials, however, confirmation of an on-time liftoff came through Social Media reports from the launch site. 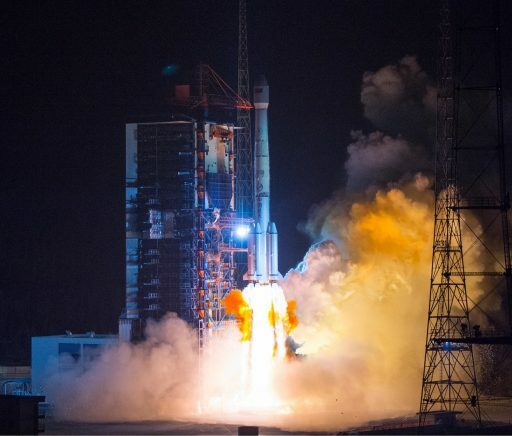 Sunday’s launch came right on the heels of the successful delivery of China’s first space observatory on Thursday that made its way into orbit on a Long March 4B rocket launching from Jiuquan. 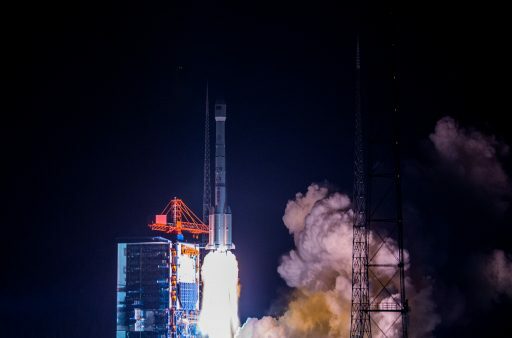 It was China’s seventh orbital launch of the year and the third Long March 3B flight in 2017, coming ahead of the usual second-half surge with well over a dozen launches still on the Chinese launch manifest including high-profile missions like the second flight of the heavy-lift Long March 5 next month and China’s Chang’e-5 in November, embarking on a round trip to the surface of the Moon and back. Zhongxing-9A, also known as ChinaSat-9A, is a direct broadcasting satellite that will beam television channels to the entire Chinese territory from an orbital position of 101.4 degrees East. Built by CAST based on the DFH-4 satellite platform, Zhongxing-9A has a launch mass of around 5,100 Kilograms and hosts a Broadcasting Satellite Services package comprising four 54 MHz and eighteen 36MHz Ku-Band transponders. 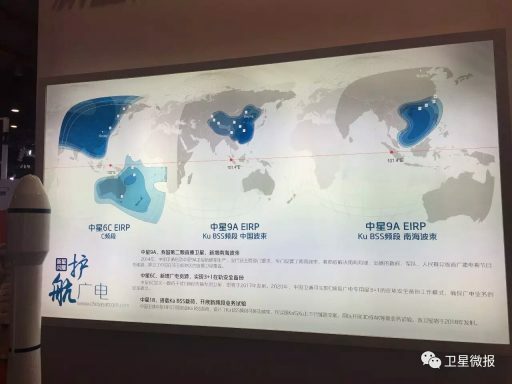 Services supported by the Zhongxing-9A satellite include direct to home radio and TV distribution with Ultra-HD support, digital media distribution, broadband multi-media services and other services in the entertainment market. The craft’s coverage zone extends across the entire Chinese main land, Hong Kong, Macau and Taiwan as well as the South China Sea. According to operator China Satcom, Zhongxing-9A will work in cooperation with Zhongxing-9 that is located at 92°E and launched back in June 2008 using a Thales Alenia Satellite Bus and a payload comprising 22 Ku-Band transponders. 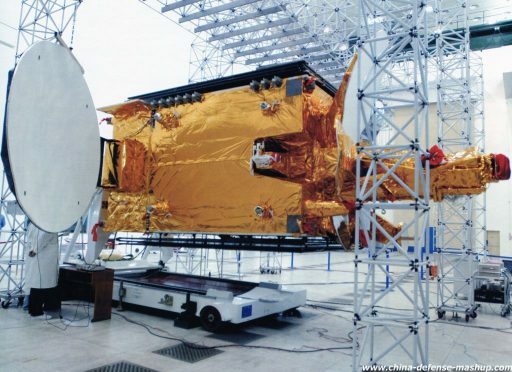 The Zhongxing-9A project was born out of the Sinosat-4 satellite that was ordered for a launch in 2008 to replace the Sinosat-2 all-Ku-Band satellite that launched in 2006 but was not usable due to a solar array deployment failure. 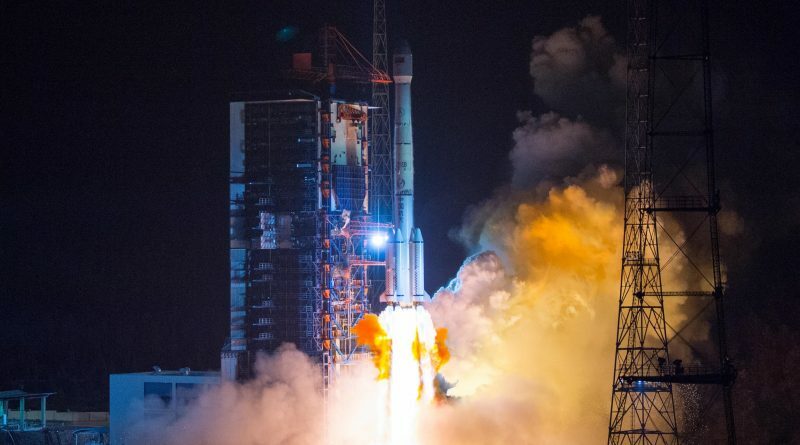 Sinosat-4 ended up being delayed and the satellite platform was eventually taken over by China Satcom for the Zhongxing-9A spacecraft. China Satcom is the country’s primary telecommunications satellite operator, owned by the China Aerospace Science and Technology Corporation (CASC). 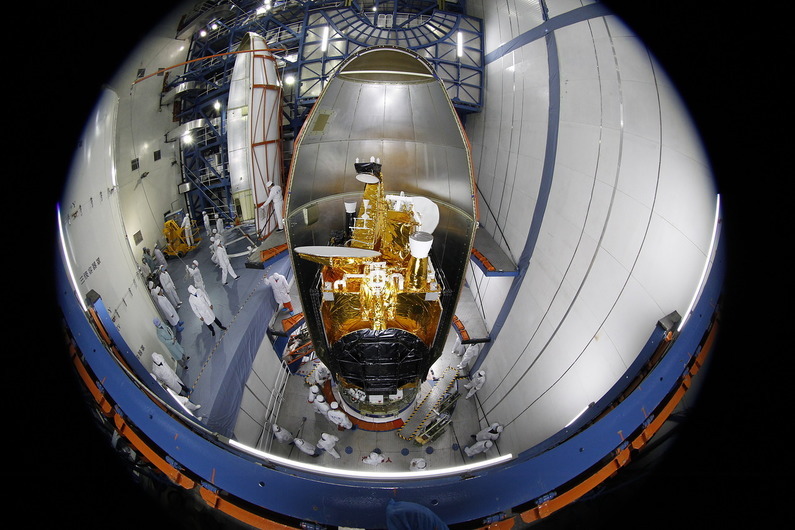 The DFH-4 bus represents the third generation communications satellite platform, capable of facilitating high-power and high-capacity communications payloads for different applications such as direct broadcasting, tracking and data relay, mobile communications, etc. DFH-4 measures 2.36 by 2.10 by 3.60 meters in dimensions and can accommodate payloads of up to 588 Kilograms, creating a launch mass of a maximum of 5,200 Kilograms. Two 6-meter solar arrays generate an End-of-Life power of 10,500 Watts of which 8kW are available to the payload. DFH-4 is divided into three modules – the propulsion module, the service module and the payload module. Onboard batteries are used to store power for night passes and power distribution is provided by dedicated avionics systems. The DFH-4 satellite platform uses state of the art navigation and attitude determination systems and reaction wheel-based attitude actuation. The satellite is equipped with a main propulsion system for the climb to Geostationary Orbit and reaction control thrusters used to assist in attitude control and stationkeeping in the Geostationary Belt that is possible with an accuracy of +/-0.05° in all directions. Long March 3B/E weighs approximately 456,000 Kilograms and stands 56.33 meters tall with a core diameter of 3.35 meters. 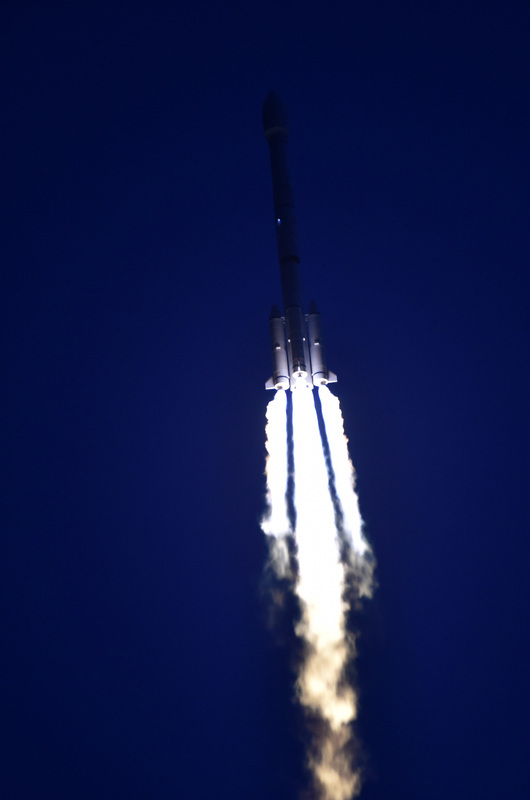 The vehicle features a three-stage stack plus four liquid-fueled boosters clustered around the first stage; the lower stages consume a self-igniting propellant mix of Unsymmetrical Dimethylhydrazine and Nitrogen Tetroxide while the third stage uses highly energetic cryogenic propellants. At 16:10:28 UTC, Long March 3B/E ignited its boosters and core stage that soared to a collective liftoff thrust of 604 metric-ton-force. Thundering off four seconds later, the rocket rose from its pad, lighting up the night skies over the Xichang launch base and completing a pitch & roll maneuver to depart to the south east. With all engines firing at full throttle, Long March 3B/E burned 2,350 Kilograms of propellant per second as it started racing uphill and making its way toward the Pacific Ocean. Each of the four boosters delivered 75,500 Kilogram-force of additional thrust to the vehicle using a single DaFY-5-1 engine that fired for 140 seconds and, in the process, were to burn 41,200kg of propellant. After the boosters dropped away, the Core Stage was to continue powering the vehicle using a DaFY-6-1 cluster of four engines delivering 302 metric tons of thrust. Overall, the 24.8-meter tall first stage launched with a propellant load of 186,200 Kilograms that was to be expended in two minutes and 38 seconds. A series of 14 pyrotechnic bolts was expected to fire to disconnect the first and second stage while the second stage’s vernier engine was already burning to pull away from the spent core ahead of igniting the 75,660 Kilogram-force main engine with the five-ton vernier providing vehicle control. The second stage launched with a propellant load of 49,400 Kilograms measuring 12.92 meters in length and 3.35 meters in diameter. While the second stage was firing, Long March 3B was to depart the dense atmosphere, making it safe to jettison the protective payload fairing and expose the ZX-9A satellite for the rest of its ride uphill. The second stage was to perform a nominal burn of 178 seconds with the vernier engine burning about six seconds longer than the main engine. Second stage cutoff was planned after the mission passed T+5.5 minutes for the third stage to immediately take over powered flight duties with its two LOX/LH2 YF-75 engines. The 12.38-meter long third stage was to deliver a total thrust of 16,000 Kilogram-force as part of its initial burn to accelerate the stack to orbital velocity in order to enter a Low Earth Parking Orbit. Shutdown of the third stage after a firing of around 4 minutes and 45 seconds was to mark the start of a coast phase of ~11 minutes to allow the vehicle to proceed on its south-easterly path toward the equator, flying about 190 Kilometers in altitude. The second burn was expected to occur around the equator passage so that the high-point of the orbit could be placed over the equator on the opposite side of the planet – standard procedure for a Geotransfer Mission. This second burn was to last for approximately three minutes and 15 seconds and consume the rest of the stage’s 18,200-Kilogram propellant load. Main engine cutoff was to be followed by a variable velocity adjustment with the vernier engines of the third stage to optimize the injection accuracy of CZ-3B. Separation of the satellite into a highly elliptical Geostationary Transfer Orbit was expected less than 30 minutes after launch, though no confirmation of launch success was available immediately after Sunday’s launch.